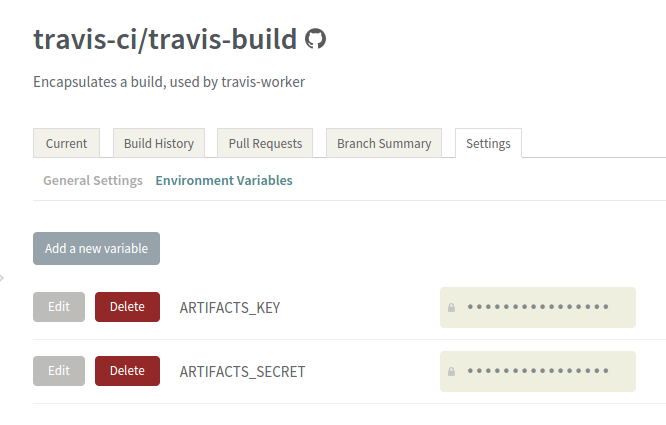 If the builds you’re running on Travis CI produces artifacts, you’ll no doubt be thrilled to hear that we want to make saving these artifacts super easy for you. The first supported tool for doing this was travis-artifacts, a handy gem-installable tool for shipping artifacts to Amazon S3. This was a great start, and solved the immediate need, but we knew we could do better. Among the problems we hoped to address were the lengthy installation process of runtime dependencies and the lack of first-class support in one’s .travis.yml. What we ended up building comes in two parts. First, there is a binary executable called artifacts. This binary may be downloaded and used directly by following the installation instructions. The above screenshot is from travis-build. # converted to a ':'-delimited string. We have some great improvements in the works to make artifacts even better, but consider this the first of many.